Figure 1. 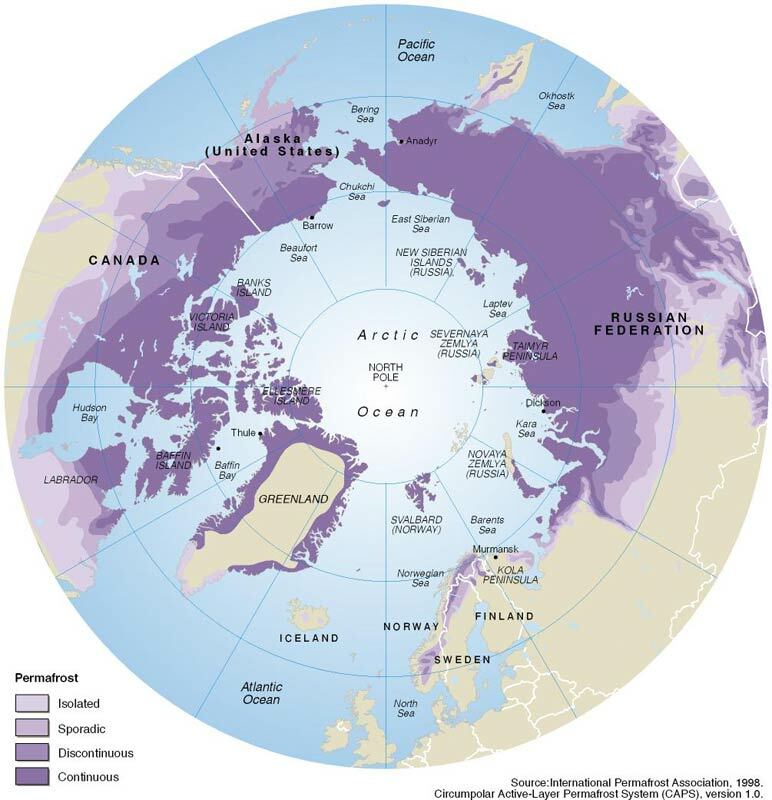 A large portion of the Arctic has permafrost. On this map, darker shades of purple indicate larger percentages of permanently frozen ground. Lighter purples, and the terms isolated and sporadic, refer to lower percentages of frozen ground. Credit: Map by Philippe Rekacewicz, UNEP/GRID-Arendal; data from International Permafrost Association, 1998. Circumpolar Active-Layer Permafrost System (CAPS), version 1.0. Many people have not ever really thought about the ground under their feet. They usually take it for granted. People may not stop to think about how the ground changes where they live, and whether or not it ever freezes for all or part of the year. Yet more than half of the land in the Northern Hemisphere freezes and thaws at some point during the year. Where is frozen ground in the Northern Hemisphere? Seasonally frozen ground freezes and thaws every year. 58 percent of the land in the Northern Hemisphere freezes seasonally. So, seasonally frozen ground makes up about 55 million square kilometers (21 million square miles). 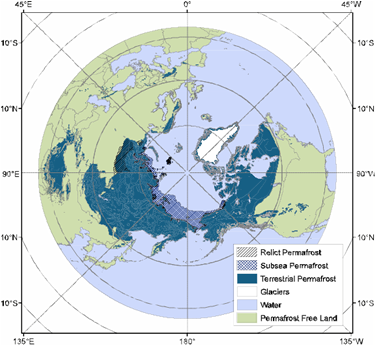 Permafrost exists where the ground stays at or below 0° Celsius (32° Fahrenheit) for at least two years in a row. 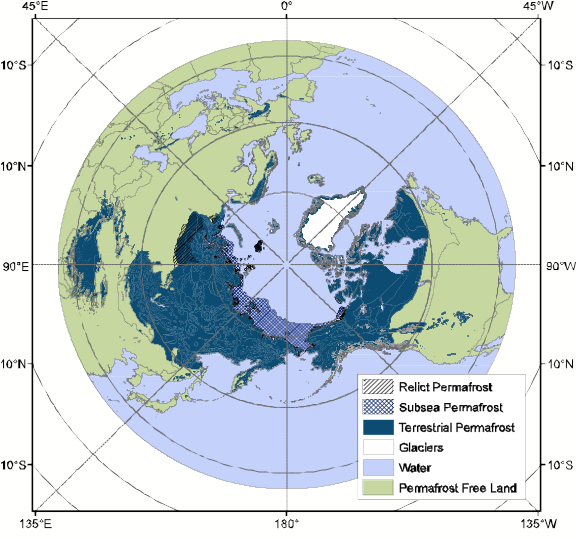 24 percent of the land in the Northern Hemisphere has permafrost underneath it (Figure 1). So, permafrost makes up 23 million square kilometers (9 million square miles). Large expanses of permafrost occur in Siberia, the Tibetan Plateau, Alaska, the Canadian Arctic, and other higher mountain regions. Where is frozen ground found in the United States? 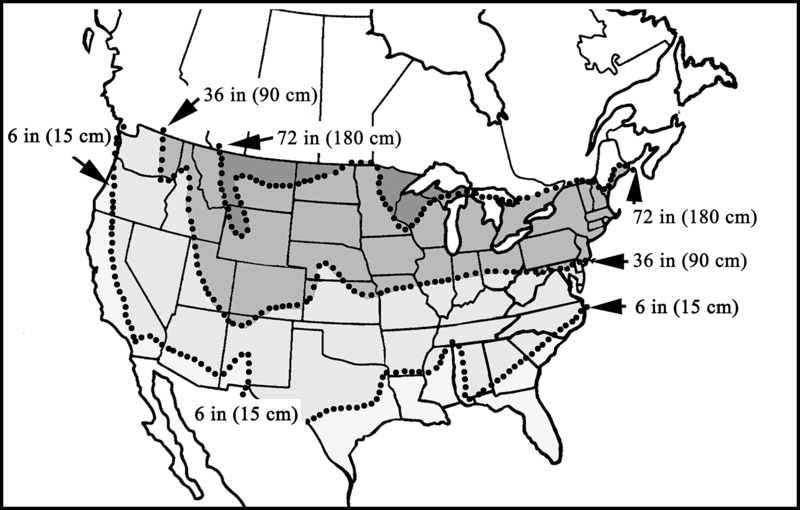 Much of the land in the continental United States is seasonally frozen ground (Figure 2). 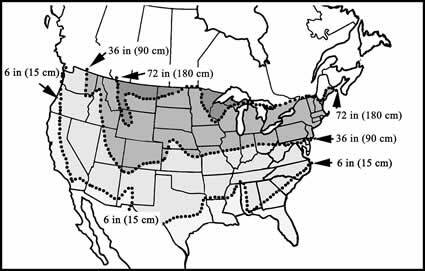 How deeply the ground may freeze can vary across the United States. Further to the north, and at higher elevations, the ground may freeze to a greater depth. The map in Figure 2 shows the varying depth of seasonally frozen ground. The lines mark the average depths of freezing. The state with the most permafrost is Alaska (Figure 3). More than 80 percent of the state's land surface has permafrost underneath it. The Rocky Mountains, in the western United States, also have permafrost. Does permafrost exist in the Southern Hemisphere? Figure 2. Most frozen ground in the United States is seasonally frozen ground. The shaded areas on the map, between the dotted lines, mark the average depth that the soil freezes to in the winter. The actual depth that the ground freezes to in any particular place may vary due to local climate, soil type, elevation, and terrain. Yes, but the Southern Hemisphere has less permafrost than the Northern Hemisphere because it has more ocean and less land. Both the high-altitude Patagonia region of South America and New Zealand's Southern Alps have permafrost. South America also has seasonally frozen ground. Earth's most southern continent, Antarctica, also has permafrost. Only about 0.3 percent of the continent's total area is bare ground, but all of it is permafrost. Scientists also think that some permafrost exists under the thick ice that covers the rest of Antarctica. The permafrost there is difficult to study, because the Antarctic ice sheet that covers it is several thousand feet thick. Does permafrost exist under the ocean? Under the Arctic Ocean, which covers the North Pole, some of the sea floor is frozen (Figure 4). Permanently frozen sea floor is called subsea permafrost. Subsea permafrost formed more than 11,000 years ago, during the last ice age. Back then, more of Earth's water was trapped as ice on land. That caused sea level to be lower than it is today. More land was exposed, and some of it froze. Then the ice age ended and the seas rose again. When the sea level rose, the oceans covered up areas of permafrost. Today, some of the sea floor is frozen up to 100 meters (328 feet) thick under the bottom of the ocean. Subsea permafrost exists only under the Arctic Ocean. Subsea permafrost does not exist in the Southern Hemisphere. Is Earth the only planet with permafrost? Scientists believe that Mars may have permafrost. The NASA Phoenix mission found a terrain feature called patterned ground on Mars. On Earth, patterned ground is only found in permafrost regions. For more information about permafrost on Mars, visit the NASA Earth Observatory page Permafrost . Figure 3. 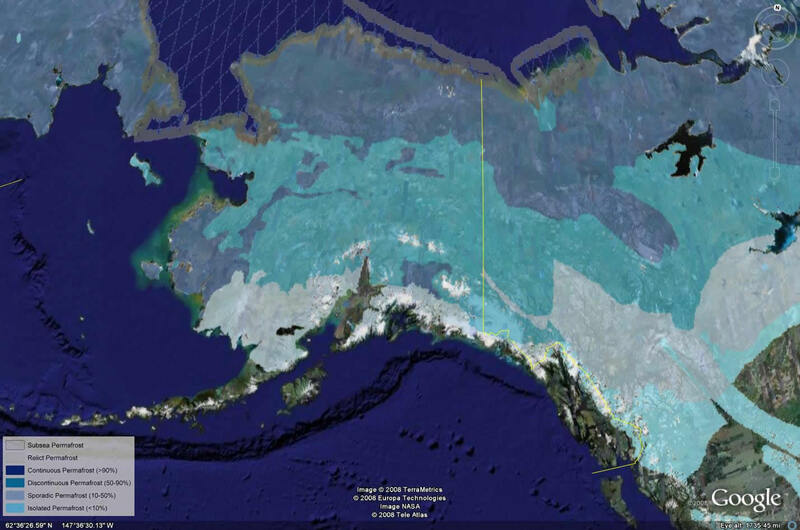 This map shows the location of different permafrost types in Alaska. 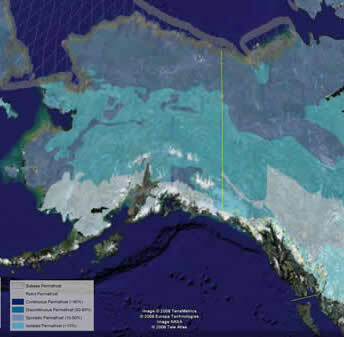 Darker shades of blue indicate larger percentages of permanently frozen ground. Lighter blues, and the terms isolated and sporadic, refer to lower percentages of frozen ground. White indicates areas where permafrost formed during the last ice age, in areas where conditions would not allow it to form today. This permafrost is called relict permafrost. See Climate and Frozen Ground for more information about relict permafrost. Figure 4. The sea floor can be frozen, too. This map of the Northern Hemisphere, looking down at the North Pole, shows different kinds of permafrost. The areas with blue cross-hatching are subsea permafrost, or frozen sea floor.